Last weekend we celebrated the summer solstice in the Northern Hemisphere: the longest day of the year. If we’re lucky, it’s a day filled with the kind of lazy sunshine that acts like it really will linger forever. A hot day filled with the sounds of birds and lawnmowers turns into a warm evening filled with barbecue smoke and laughter. The day practically screams ‘Welcome to Summer.’ This is what nostalgia is made of, folks. May your days be warm, your barbecues hot and your drinks cold. Happy summer, everyone! Bacon-Wrapped Jalapeno Hot Dogs. Summer eats at their finest. These dogs may seem gluttonous, but trust me, they’re amazing. An instant crowd pleaser – your guests will be so impressed! Chicken Teriyaki Burgers with Grilled Pineapple & Caramelized Onions. There’s nothing like fresh, grilled pineapple caramelized on the grill. The smokey and sweet fruit is killer when topped on tangy teriyaki burgers! Spinach & Artichoke Burgers with Sundried Tomato Mayo. Packed with spinach and artichokes, these turkey burgers are far from boring. These are a great way to disguise some spinach into your diet! Goat Cheese Stuffed Mushrooms Wrapped in Bacon. What is it about things wrapped in bacon? These bit-sized appetizers are insanely delicious and so simple to make. The recipe calls for baking them in the oven, but they’re equally great when charred on an open grill. Moroccan-Inspired Apricot Couscous Chicken Salad. 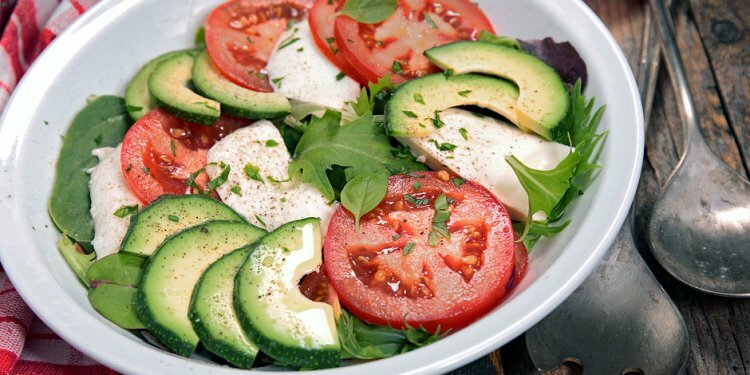 This salad is one of my faves, and it comes together in minutes. It’s fresh and light with a slight kick of spice, but still mild enough for most palettes. The couscous base can be made in advance, leaving you plenty of time to enjoy your day before firing up the grill for the chicken. Frango Grelhado – Portuguese Grilled Chicken. Quick and simple marinade, amazing results. Scales easily for big parties, a tried and true crowd-favourite. Kalbi-Style Maui Ribs. Can’t make it to Hawaii? Bring Hawaii to you. The ribs in this recipe are cut flanken-style so they cook nice and quick. Quite literally, finger lickin’ good. Moroccan Quinoa Stuffed Peppers. My beloved vegetarians, I haven’t forgotten you! These peppers are a great barbecue main dish for vegetarians and meat lovers alike. Naturally gluten free and just as delicious made vegan! Thai Cucumber Salad. Ok fine, you don’t actually put this recipe on the barbecue, but it is great WITH barbecued things. The freshness and acidity in this salad are the perfect complement to anything cooked over a nice smoky grill.